We’ve all seen quotes like “A one hour workout is 4% of your day, no excuses” or “Someone busier than you is working out right now”… while motivating, the reality is that life is busy and there never seems to be enough time. Balancing work, family, friends, sleep, exercise and other activities is a struggle more often than not! This is where supersets and circuit training come in handy as highly effective workouts that boost metabolism while strengthening various muscle groups and can be done quickly. Both supersets and circuit training can be tailored to target muscle groups, strength training experience level and available gym equipment. Both ramp up the intensity of one’s workouts by eliminating or lowering time required for rest periods and as a bonus, are a fun way to add variety to one’s strength training routine. A superset is a form of strength training where one alternates two exercises back to back with little or no rest period between them. Typically, the two exercises work different muscle groups or movement patterns and with the right combination, supersets can offer huge benefits. Types of supersets include: (1) an antagonist superset with two exercises that target opposing muscle groups, eg. a set of bicep curls paired with a set of tricep dips; (2) a compound agonist superset where both exercises work the same muscle groups, eg. a push-up and a chest press; and (3) an unrelated superset where totally different muscle groups are targeted, eg. a lunge and a set of bicep curls. Supersets can be powerful tools allowing one to help boost calories burned and increase heart rate with limited exercise time. Supersets have been proven to increase energy expenditure significantly more than traditional resistance training when expressed relative to time. Given that rest periods are effectively reduced or eliminated, the two exercises in a superset also serve as active recovery for each other, helping to improve muscle endurance. First developed in the 1950s by R.E. Morgan and G.T. Anderson at the University of Leeds, circuit training is a form of strength training where one cycles through several exercises (usually 3-10) targeting different muscle groups with minimal rest in between. Since muscle groups are alternated, one muscle group rests while another is working. Circuit training can be designed and modified to adjust for various fitness components, including cardiovascular endurance, muscular endurance, power and more. 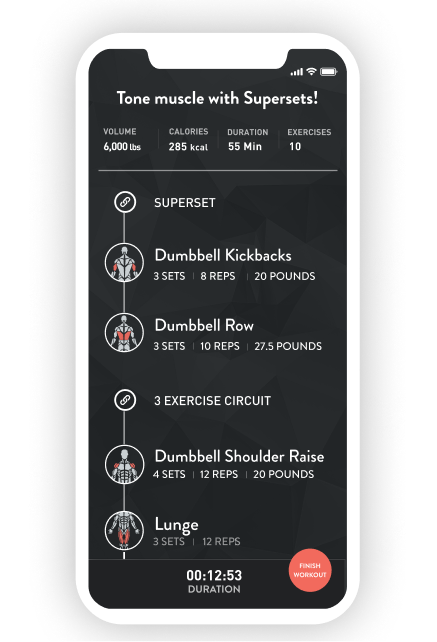 Similar to supersets, benefits include max results in minimum time, an increased calorie burn and heart rate and the ability to combine cardio and strength training while tailoring circuits to available equipment or experience. It has been shown that a high intensity circuit training regimen may also improve muscle endurance through muscle strength and aerobic fitness. While both supersets and circuits offer immense benefits, programming and selecting the exercises for both can be difficult and the wrong combinations can mistakenly overdo the core or the spine. Fitbod’s new supersets/circuits feature uses its vast database of strength training data points and incorporates its unique machine learning algorithm to recommend the best superset or circuit for each individual. Based on an individual’s muscle recovery, workout progression, available equipment, fitness goals and more, Fitbod optimizes and builds a personalized superset and circuit training workout tailored to the individual. Fitness and strength training is never one size fits all so why not use the best technology available for your personalized workout today? Try Supersets in Fitbod for Free! Run, Ride, Row and more with Fitbod!